This poem was chosen in response to Jennifer Bevill’s artwork, “Undersea”—can you talk about the experience of finding words that were in conversation with the image? What leapt out first from the art? A particular image? A mood? A line? Poet Sheila Kelly: What leapt out first was the gridwork which read as a kind of wire cage; it felt scary and threatening. The filigreed vine motif captivated me, too, because it had such a different feeling from the grid: decorative, homey. I was drawn by the depth of the assemblage and by a ghostlike figure that lurked there. I carried the images and held that tension in the back of my heart-mind and hoped a poem would begin to emerge. I didn’t look at Jenny’s title to stay as open as possible. After a while I began to see an upended bed and started to shape language around a recent experience involving a friend, homelessness and mental illness. What surprises you about Sheila’s poem in conversation with your art? Artist Jennifer Bevill: Sheila really picked up on the identity of this baby and I love that. She gave it a history and a dynamic context. And even a mother who I guess then got taken away. 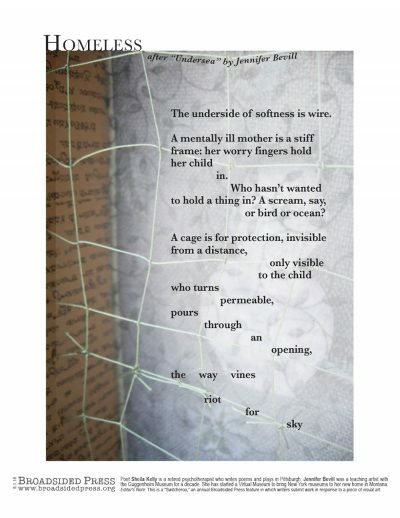 It’s a heartbreaking poem which really got to the feelings behind the net of strings over the front of the piece and the image of the baby falling. Poet Sheila Kelly: I couldn’t have written this particular poem without the gifts of Jenny’s textures, patterns and that trapped ghostly figure. It’s hard for me to think of the poem doing something “different” paired with the art because it was born from the art; in my mind, inextricably paired. I think the poem can stand alone and still have impact, but it is enlarged and elevated by its pairing with Jenny’s hauntingly beautiful art. They belong together. Artist Jennifer Bevill: I think this poem makes the art more sad, even tragic, with violent undertones. It resonates with the art. It’s not how I was feeling exactly, when I made the piece, but it definitely takes the emotions I was working with in a more intense direction. Have you ever written work that has been inspired by visual art before? What was that experience like for you? Why were you inspired to do so? Poet Sheila Kelly: I have done lots of ekphrastic writing, and in fact, I lead ekphrastic workshops in local art galleries thanks to my friend and collaborator, the poet Laurie McMillan, who turned me on to the joys of writing to art many years ago. Taking time to respond in writing to a work of art has changed the way I engage with it. Standing in front of a painting or sculpture is one thing, but allowing myself time to have a conversation with it expands the encounter to a much deeper level. Writing to art is really just using a set of constraints, like traditional forms, prompts and/or word banks; constraints can break us out of habitual patterns and language to help set us free. And it’s fun! Artist Jennifer Bevill: No and it’s amazing. Especially being able to see two such different interpretations that both have real connections to my own intentions for the piece. Wow. If your collaboration were a song, what would it be? Poet Sheila Kelly: Maybe Rachmaninoff’s Concerto No. 2 in C minor, written after a period of depression for the composer. Rachmaninoff was helped by a therapist at that difficult period in his life and he dedicated this concerto to him. I like to think I hear healing and an exultant breaking free in it. Poet Sheila Kelly: I’m re-reading Staying Alive: Real Poems for Unreal Times, one of my all-time favorite poetry anthologies, edited by Neil Astley. And William Stafford’s The Way It Is: New and Selected Poems. I love his writing. And Ten Windows: How Great Poems Transform the World by a poet I admire a great deal, Jane Hirshfield. There is so much to read! Artist Jennifer Bevill: When I was going through a hard time lately, a time of loss, I read Cheryl Strayed’s book Wild. It was so amazing that I look for more books by her and found a little book of quotes from her “Dear Sugar” columns called Brave Enough. Everyone should own this book. It’s full of Cheryl’s own special brand of wisdom and straight talk. Poet Sheila Kelly: The Society for Contemporary Craft here in Pittsburgh just closed a long-running exhibition called Mindful: Exploring Mental Health Through Art. Artists as diverse as Swoon, Meredith Grimsley and Rose Clancy brought compelling and unsettling images to life in their art; provoking conversation, reflection and response. The stigma around mental illness persists even though one in four of us will be touched by it during our lifetime. We have to start talking about it, openly and often, and poetry and art is a great way to spur conversation. Artist Jennifer Bevill: I guess I’ll stick with my theme and recommend another street artist, the French photographer and “paster” JR. Look for his TED talk about how art can change the world and then follow his Instagram. He travels the world taking pictures and pasting them in locations that will start dialogues about everything from the conflict in the Middle East to women’s struggles in the favelas of Rio. Poet Sheila Kelly: I’d like to thank editors Elizabeth Bradfield, Sean Hill (outgoing), Roger Sedarat (incoming), and Alexandra Teague of Broadsided Press and artist Jennifer Bevill for “Undersea.” I am honored to be part of this collaboration; to add my voice to the conversation between the arts. We got so many fascinating responses to this year’s Switcheroo—watery ones, caged ones, bookish ones. Poems and short prose that followed the image closely and work that drifted out from it. We wanted to pick just one, but we we couldn’t. So this year, we give you two. We hope that you love the opportunity to consider what different work can be inspired by a single piece of visual art. Different subjects and emotional registers; different tones and engagements. Note: These broadsides are the result of the 13th Broadsided Press Switcheroo. What is The Switcheroo? Every year, during National Poetry Month, we like to turn the tables and invite writers to respond to art we post. All Broadsided artists were invited to submit up to three pieces of work for the Switcheroo. We then asked Michele L’Heureux the 2015 Switcheroo artist, to review the submissions, choosing one that she thought would be open to literary response and would work in the Broadsided format. I love the ambiguity and abstraction of the light grey vessel-like/figurative form on the right, and I’m a sucker for a grid, which has all sorts of connotations: fence, quilt, net, cage. I also think the indecipherable text on the left side is very provocative, ripe for all kinds of translations. The delicate vine and leaf pattern lends a strange prettiness to what otherwise feels like a slightly eerie, prison-like environment. I feel as if I might be peering at the underside of an exposed mattress or box spring, which is a space that seems fraught and complicated, with plenty of stories to tell. Poet Sheila Kelly is a retired psychotherapist who writes poems and plays in Pittsburgh, Pennsylvania. She leads writing workshops in libraries, community centers, and art galleries which reach out to writers and non-writers alike. She believes in the special power of generative writing in groups as a source of healing and connection with others. She credits poetry with giving voice to the chaos, mystery and beauty of life. Most recent poems are in The Comstock Review, Paterson Literary Review, and Pittsburgh Poetry Review. Jennifer Bevill grew up in Alabama, spent most of her life in New York City and finally moved to Montana. She received her BFA from Parsons School of Design and her MA from Teachers College. She loves designing experiences for groups of people to engage with art. A teaching artist with the Guggenheim Museum for a decade she now teaches at Flathead Valley Community College and has started a Virtual Museum project, bringing the museums of NYC to northwestern Montana. New work: jennybevillart on instagram. Artist Jenny Bevill Vectorizes on a notice board.